In the magical world that is the restaurant scene in Chicago, there lie only a handful of restaurants that have garnered the coveted two- and three-star Michelin ratings. After having experienced the weekend of my life last year dining at the only three-star Michelin restaurant, Alinea, then dining at Graham Elliot (now closed) the night after, I sought to find a similar experience this year. My trip to Chicago was only for one night this time, so I had to choose wisely. There were only four restaurants with two stars (three stars is the highest and has only been awarded to Alinea) in the 2014 Michelin Guide this year. One of them I had never heard of -- Grace Restaurant. Being awarded two Michelin stars only one year after opening is probably unprecedented and sparked enough interest for me to book a reservation. And, yes, they can accommodate a vegan diner, they said. What was most intriguing about Grace was that the chef, Curtis Duffy, was the Chef de Cuisine at Alinea for several years before leaving to go to Avenues at the Peninsula. Under Duffy's direction, the Avenues was awarded two stars from the Michelin Guide, the AAA Five Diamond Award, and four-star ratings from Chicago Magazine and the Chicago Tribune. 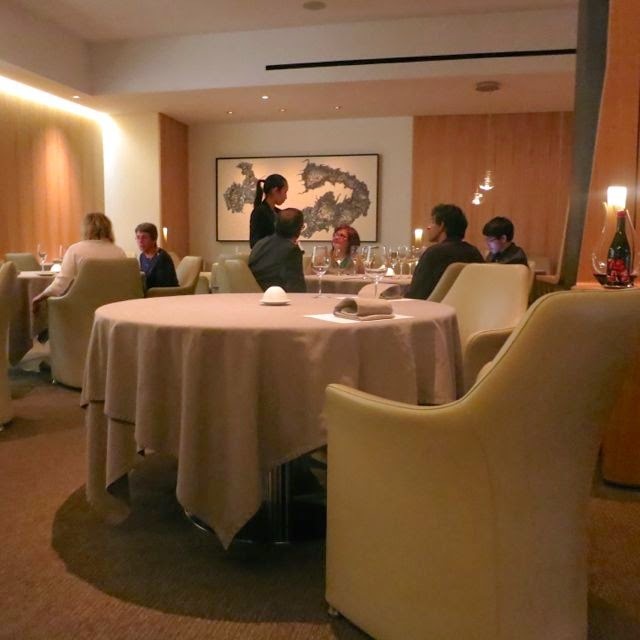 Other reports noted that Duffy's restaurant was the second most expensive restaurant in all of Chicago, second only to Alinea, with a tasting menu that recently increased to $205 per person. With prices like that, one would expect excellence. 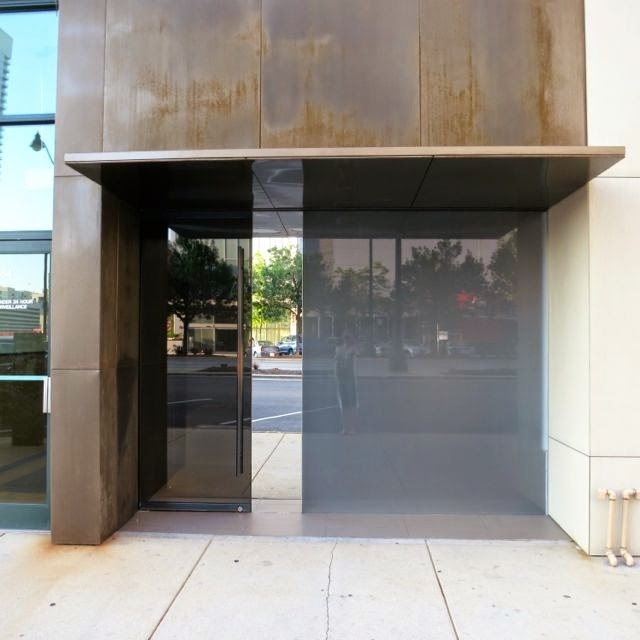 The rustic steel exterior complemented the clear glass doors nicely in creating a contemporary look. As I pulled open the large glass door and walked inside, I was somewhat disappointed with the lack of pizzazz as all I saw was a host ready to seat me. A typical restaurant decor is not what I was expecting from this top restaurant. I should probably take a moment to explain where my expectations lied when I entered Grace. Having dined at Alinea and knowing this chef worked there and priced his meals just behind Alinea made me enter with expectations of a similar experience -- one that would blow me away. Let's move on. I was dining alone on this evening as my good friend in Chicago had to take a last minute trip to Germany. I was actually looking forward to seeing what a tasting menu experience at a top restaurant would be like alone. Immediately they asked me if I desired a Kindle. A Kindle? Oh, like an Amazon Kindle -- yes, please. They discourage the use of phones in the dining room so I could read the news on the Kindle as I waited for each dish to arrive. I loved that. At Grace, one can choose from two different tasting menus -- Flora or Fauna. The Fauna is the meat-focused track and the Flora is the vegetable-focused track. The Flora is not vegetarian by design so they need a heads up if you are requesting vegetarian or vegan and they seem happy to modify the menu to accommodate. I also ordered the wine pairing for $125. The dining room was elegant with muted beige tones, plush seating, and contemporary artwork. It wasn't quite what I was expecting, but definitely fit the name of the restaurant. In the back, through glass walls, you could watch the chefs at work, which is always fun to see. 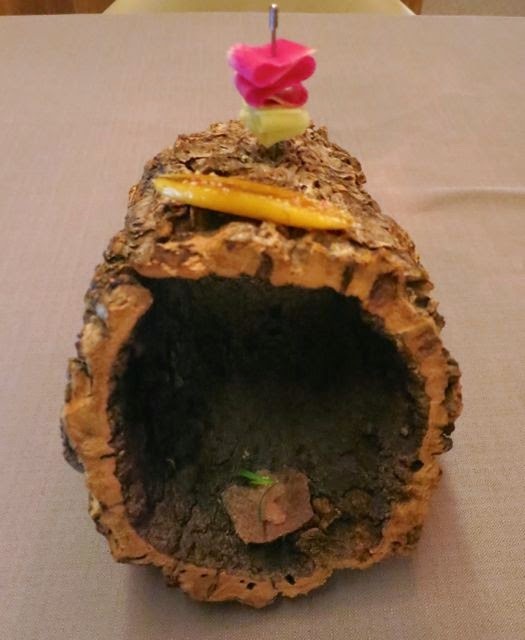 The experience began with the canape, which was three bites in a log. On the top of the log was a buttery banana brulee with pink peppercorn. Behind it on a spear were mandoline-sliced watermelon radish and green apple. And inside the log, was a quinoa chip with tarragon and kaffir line. The chip didn't taste like much and the radish and apple were quite plain. The wine pairing was a 2007 Ferrari "Perle" from Trento. The first official course was salsify, a white root, served two different ways. 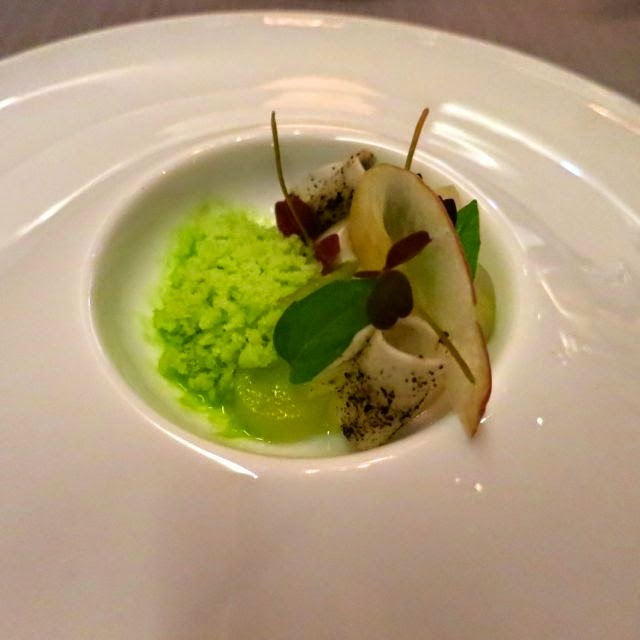 The salsify was sliced thinly and served with apple ice and compressed green apple. The cream was very good when paired with the chilled apple ice as the two textures complemented each other nicely. For the second course, I was served peas three different ways -- this is how they introduced the dish. There were fresh blanched peas, peas pressed into dumplings, and pea shoots. 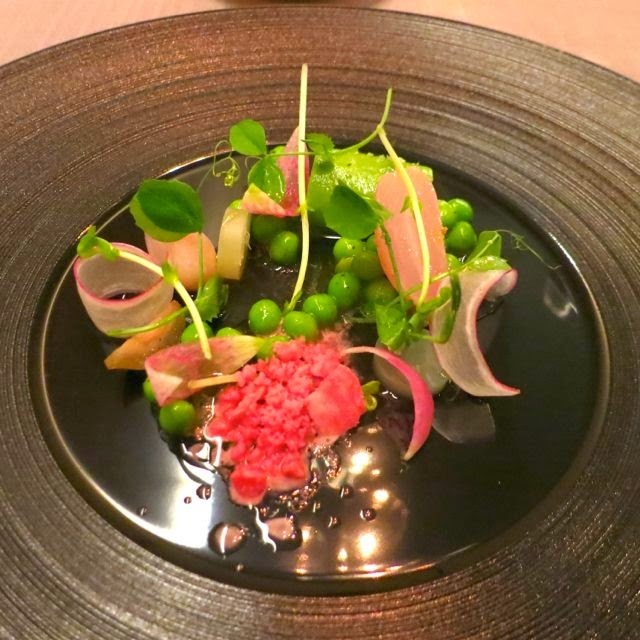 Served with French peaches and radishes, I was impressed that the dish was designed around peas. Overall, though, this dish was a bit plain. The 2011 Louis Guntrum Scheurebe from Rheinhessen was very sweet and paired well with this dish. 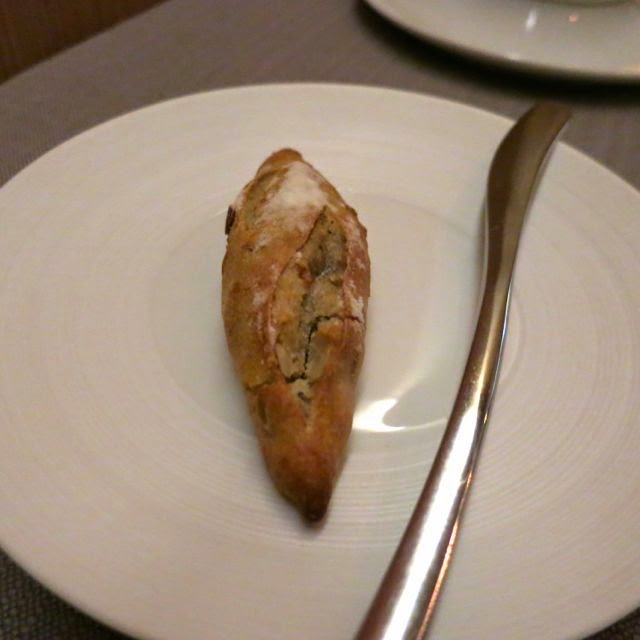 Bread was served after the third course with an olive oil emulsion. The bread was scrumptious. The third course was artwork. Shaved asparagus was placed atop shredded pastry and meyer lemon. Underneath was pureed asparagus. I found there to be too much lemon in this dish (and I love lemon) and the pastry to be on the salty side. The bites without lemon were my favorite. A 2010 La Pietra di Tommasone Biancolella was served with this dish. The fourth course was the first course I really loved, surprisingly. 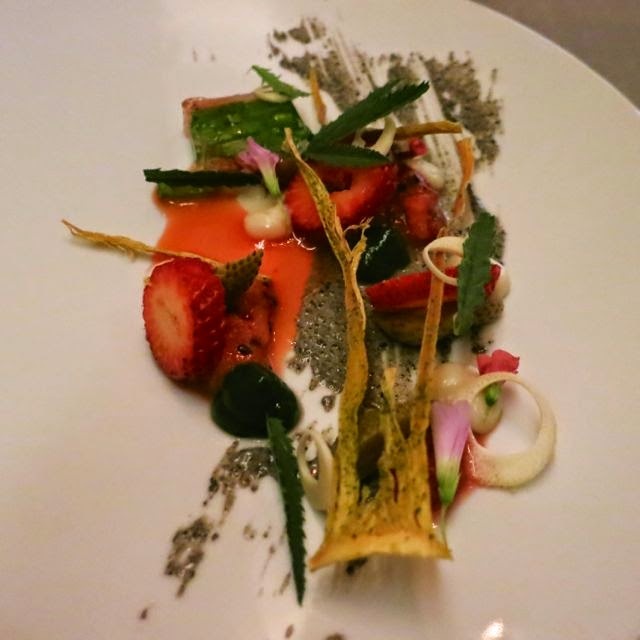 Yet another piece of artwork, this dish centered around strawberry jam while featuring green and red strawberries, fried onion, and sliced hearts of palm. It combined sweet, crunchy, and savory all in one. Most impressive was the strawberry and snow pea terrine made with agar and when mixed with the smear on the plate, was amazing. A 2011 Centonze Frappato complemented this dish. The next dish was introduced and it was indicated that I should consume it, then "something else will happen." 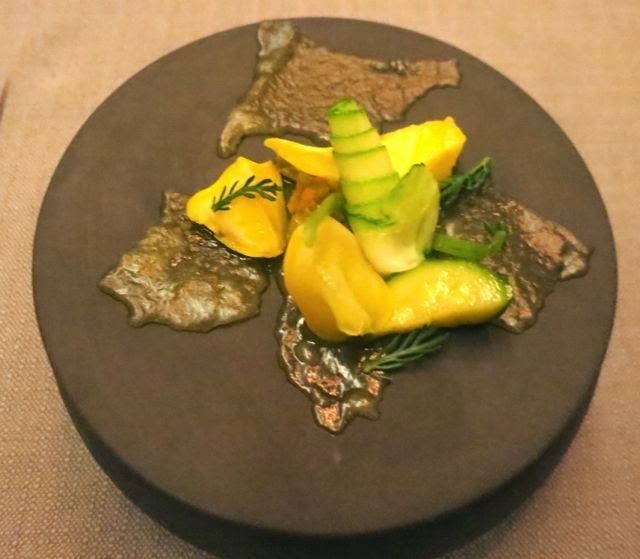 This dish was centered around pattypan squash served with pineapple and chamomile. 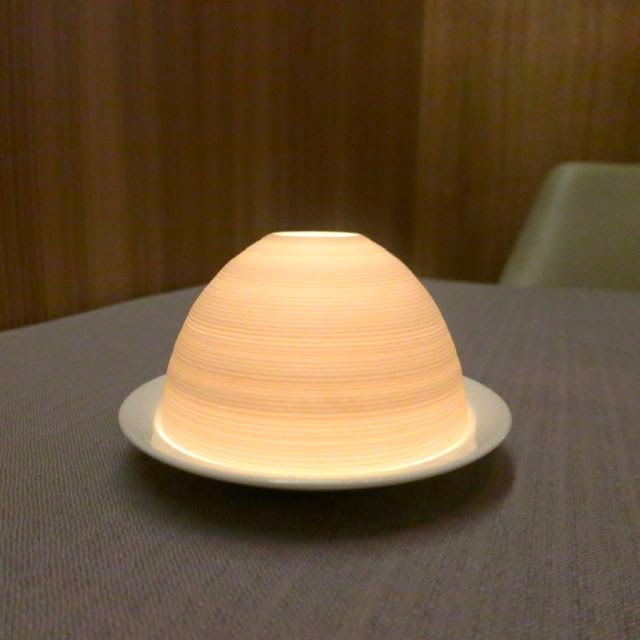 I found this dish to also be quite plain. A 2011 Domaine de l'Ecu "Cuvee Classique" Muscadet from Sevre et Maine was served as well. Once finished, they took the top off that dish and inside the bowl was yet another dish. 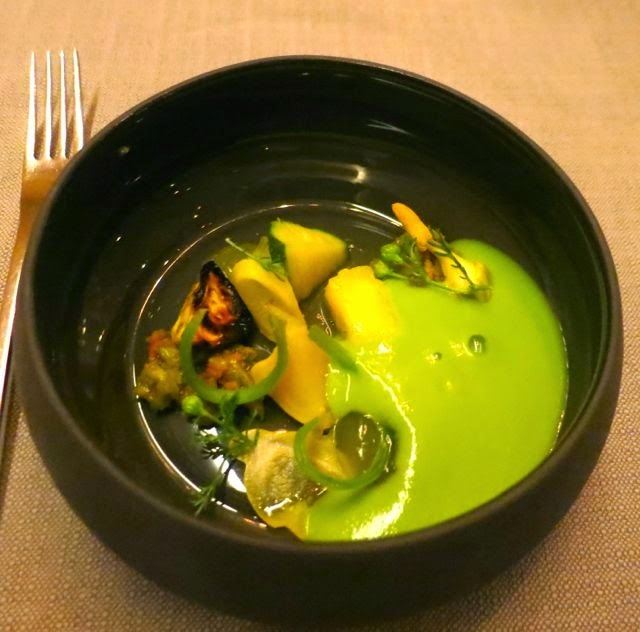 This dish had the same ingredients as the last dish, but with a zucchini soup. Next up was another dish that I really enjoyed. Roasted trumpet royale mushrooms in a mushroom jus (broth) with 10 puffed grains. The mushrooms were tender and firm, the grains were crunchy, and there was a surprise olive that added richness to the dish. The 1999 I Doria di Montalto Pinot Noir Riserva "Querciolo" from Oltrepo Pavese was an unusual bordeaux-like rich Pinot that added a nice complexity as a pairing. Now for the sweet courses. In an unexpected way, they handed me my next dish. 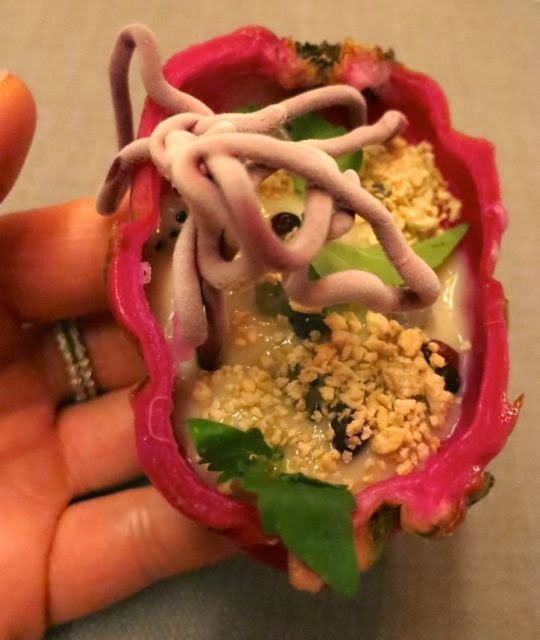 It was a dragonfruit filled with rice pudding and flavored with lemongrass. The squiggles on the top were made by freezing blackberries in liquid nitrogen. Amazing. The pairing was a 2005 Domaine Yves & Denis Breussin "Reserve" Moelleux from Vouvray. An intermezzo or palate cleanser before the final dessert was appropriate here. 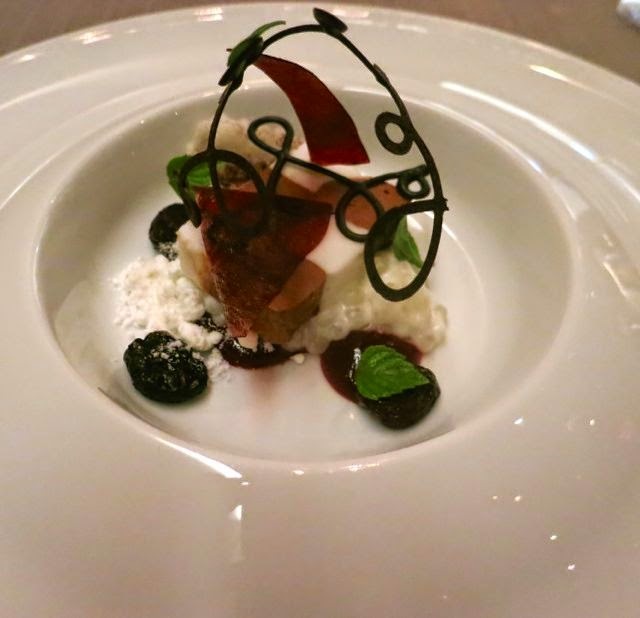 It was a compilation of sweet blueberry vinegar, carbonated grapes with lemon verbena, and frozen basil puree. This was served with a 2013 Elio Perrone "Bigaro" from Piedmont -- a very sweet wine pairing. The ninth course -- the final dessert, was elegant. They called it "chewy cherry and cherry chip" as it consisted of chocolate and coconut ice cream with tapioca pudding and fresh mint. It was an impressive mix of flavors. Throughout the courses, the sommelier described the wines not only for their notes and complexity, but also the terroir and origin in such a way that only a great sommelier could. She tripped up here and there referring to fish that is normally in this tasting menu that was removed from mine, which disappointed me as it showed a lack of attention to detail. The service was quite good, but not all the servers knew everything about the dishes and when I asked specific questions, certain people had to come out to answer them. When I appeared to be cold (temperature-wise), they offered me a shawl and when my Kindle locked up, they were happy to show me how to unlock it quickly. At the end, they offered me a tour of the kitchen. It was very cool to see how many people it took to plate and prepare these meals for a full dining room. As I walked out, they handed me the menu in a vellum envelope and inside was a white chocolate bar. The menu was not at all customized to the meal I actually consumed and still stated the fish and other animal products that were in the typical tasting menu. The next day, I called and asked if the chocolate bar was vegan. They quickly apologized and noted that it was their mistake for giving me their standard non-vegan chocolate bar. In the end, for a $435 dinner (including tax and tip), I felt it was not up to the standards I expected from a two-star Michelin rated restaurant. 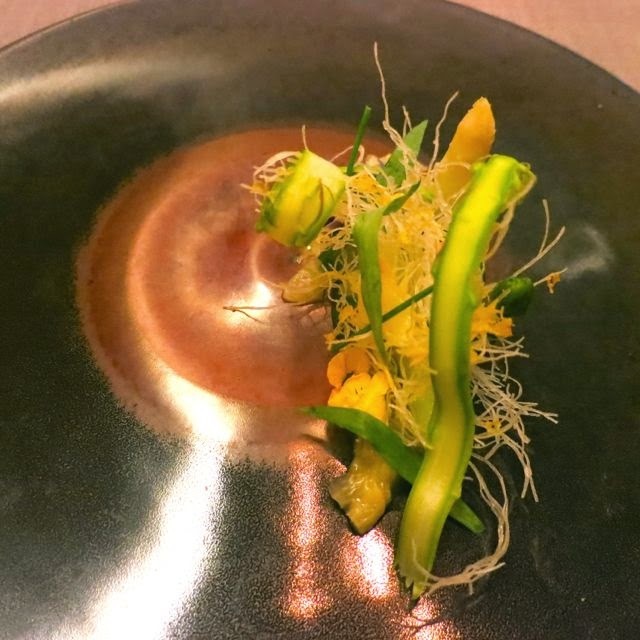 The lack of attention to detail in serving a vegan just wasn't there in the slip-ups by the sommelier, the confusion of what was in some dishes by certain servers, the lack of customization of the printed menu, and the gift of non-vegan food at the end. All of these are excusable at a normal restaurant, but for a restaurant of this caliber, anything less than perfection cannot be excused. Some of the dishes were very good, but others were quite plain and it felt like not enough thought had gone into what needed to be added into the menu when they were converting it to vegan rather than focusing on just what needed to be taken out of the dish. With two months of notice, I expected more. I will say that the wine selection was superb and the presentation of the dishes was spectacular. So, I enjoyed the experience, but if I had to choose just one restaurant to dine at in Chicago, I'd pay just a little more and go to Alinea. For just $45 per meal more, you get an experience that is several levels above the experience at Grace. 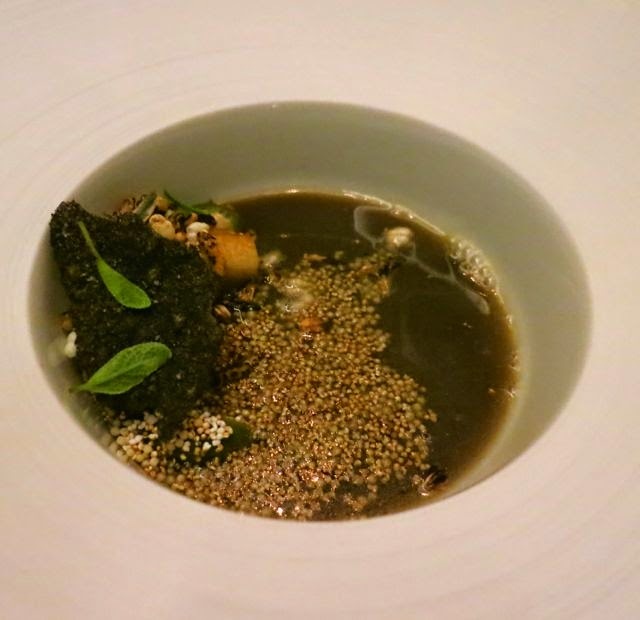 Alinea is truly in a class by itself and if Grace wants to price itself that close to Alinea, then it should really step up all aspects of the dining experience as it has a long way to reach Alinea's level of perfection.